His last two seasons injuries and offseason surgery have kept Stephon Gilmore from being in top form at the start of the year. The fourth-year corner is determined to be at his best right from Week 1 in 2015. In our Camp Countdown, presented by M&T Bank, we list the main reasons why Gilmore should excel in 2015. One of the chief reasons is his current health. Though he is coming off an offseason procedure it was not nearly as invasive as his hip surgery in the 2014 offseason, meaning he’ll be full go for training camp. That means he won’t have to use regular season games, like he did the last two years, to get into top playing form. A Revis role for Gilmore? Mum has largely been the word as to just how far the Bills defensive staff intends to go in utilizing the talents of Stephon Gilmore this season. Will he stay on one side of the field and work? Will he follow the opponent’s best wideout all day? Chances are it will be a bit of both. So does that mean Gilmore will fill a role similar to that of Darrelle Revis? In a word, probably. It’s clear that Rex Ryan, defensive coordinator Dennis Thurman and secondary coach Donnie Henderson all see Gilmore as the elite corner in Buffalo’s defensive backfield. It’s also evident they have big plans for Gilmore this season. The only problem is no one has seen it in action because Gilmore was held out of spring practices in the team setting due to an undisclosed offseason procedure. The difference this year is Gilmore will be full go in training camp and the preseason, which was not the case last year when he was coming off offseason hip surgery. So what has Gilmore been told by his defensive coordinator concerning his role in 2015? We’ll have much more on just how Gilmore’s game could really excel in 2015 when our Camp Countdown series, presented by M&T Bank, continues on Thursday (July 9th) here on Buffalobills.com. The winner of the M&T Bank Predict the Picks contest came to St. John Fisher College for Buffalo Bills Training Camp. Dan Minns from Geneva, NY and his fiancée Holly Ferrell won a meet and greet with the Bills 2014 First round draft selection, Sammy Watkins. Dan got all of the questions correct in the Predict the Picks contest including the Bills will trade up with their first pick and the first pick will be Sammy Watkins, WR out of Clemson. Fifty second place winners who answered at least half of the questions correctly were randomly selected and received an official 2014 Bills Draft Cap. The M&T Bank Touchdown for Teachers deadline for nominations is fast approaching! Nominate your favorite teacher now for a chance to have a Bills player visit his or her classroom! Five finalists will be honored during the December 4th Buffalo Bills home game vs. Tennessee Titans for their outstanding service to their schools and communities. Just fill out a nomination form. The deadline to nominate is this Friday (Nov. 11th). Here’s a heads up on tickets for the unveiling of the new Bills uniforms for 2011, which will happen at Ralph Wilson Stadium on June 24th. Here is a listing of the M&T bank branches and Verizon Wireless locations where you can pick up tickets in person. Tickets will be available beginning Friday, June 3 at 10 a.m online as well. There is a ticket limit of six (6) tickets per person. Know who the Bills are taking first? If you do get yourself on over to the Bills Draft Day microsite, for the M&T Bank Draft Day Challenge… quickly. You only have until April 22nd to enter the name of the prospect you think will be the Bills top draft choice. If you guess correctly you’ll have a chance to win an autographed jersey from the Bills number one pick, a photo op with the top draft choice and a tour of the Bills training facility. So get to the Bills Draft microsite now and make your pick for who you think will be Buffalo’s top draft choice. Time is running out. M&T Bank is designing a new Bills Check Card and wants to know what Bills fans think. Help by voting on the designs choices. You just might help choose the next check card used for Bills Checking. Click here to view the designs and vote on your favorite. I kind of like option ‘C’ myself. 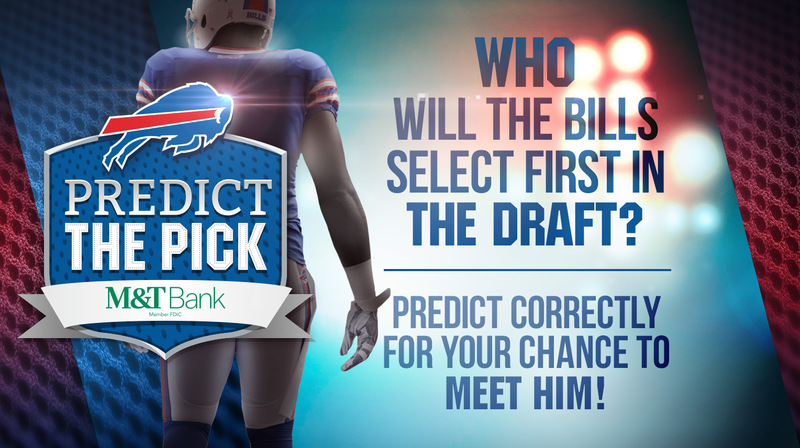 If you think you’ve got an idea on who the Bills will take first in the 2010 NFL draft you better get in on the M&T Bank Draft Day Challenge now. You’ve got a chance to win an autographed jersey from the team’s number one pick, a photo op with the top draft choice and a tour of the Bills training facility, if you correctly pick the player. That’s one heck of a haul not to mention bragging rights amongst your fellow fans. But you only have until April 22nd, so log on to the Bills Draft micro-site on buffalobills.com to make your prediction. Who do you have as Bills top pick? With a chance to win an autographed jersey from the team’s number one pick, a photo op with the top draft choice and a tour of the Bills training facility, if you correctly pick the player you could have a heck of a haul and bragging rights amongst your fellow fans. Up until April 22nd, you can visit the Bills Draft micro-site on buffalobills.com to make your prediction. The contest is open to legal residents, 13 and older, of the following states: Delaware, Maryland, New York, Pennsylvania, Virginia and Washington, D.C.
Bills pep rally at M+T Bank Plaza today! If you want to get fired up for Monday night football on your lunch break today be sure to head to 1 M&T Bank Plaza in downtown Buffalo for the Bills Monday Night football pep rally beginning at noon. The event which includes live music and entertainment as well as a chance for fans to win signed Bills memorabilia runs from noon to 2pm where a surprise Bills alumnus will also make an appearance. It’s all part of the Built for Bills Fans Campaign brought to you by M&T Bank.